› Author AffiliationsThis research was supported by Conseil Régional de Normandie, CNRS, Normandie Université, LabexSynorg (ANR-11-LABX-0029), and European FEDER funding. 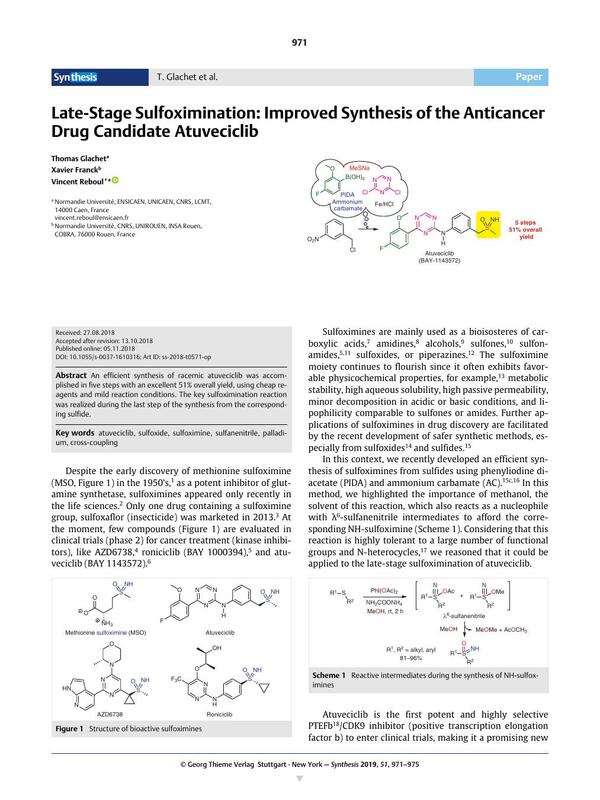 An efficient synthesis of racemic atuveciclib was accomplished in five steps with an excellent 51% overall yield, using cheap reagents and mild reaction conditions. The key sulfoximination reaction was realized during the last step of the synthesis from the corresponding sulfide. Supporting information for this article is available online at https://doi.org/10.1055/s-0037-1610316. 17 The reaction conditions were compatible with various heterocycles. See reference 14. 18 PTEFb is a heterodimer of CDK9, which is exclusively involved in transcriptional regulation of RNA polymerase II. 29 The enantiomers were separated using chiral HPLC and according to specific rotation measurement, the major enantiomer is (S)-atuveciclib. 30 Kagan’s conditions usually work for liquid substrate and aromatic/alkyl thioether. The poor asymmetric induction in our case might be due to the nature of starting material (solid and alkyl/alkyl thioether). 31 Currently, (R)-atuveciclib is obtained via chiral preparative HPLC separation. See reference 19.